[Wednesday, July 1, 2009] TerreStar-1 has a liftoff mass of 6,910 kg. and was carried as a solo payload on today's Ariane 5 heavy-lift mission from the Spaceport in French Guiana. [Thursday, July 2, 2009] To mark its proud association with one of mankind's greatest adventures, Swiss watchmaker OMEGA brought four of the surviving Moonwalkers together along with some of the other luminaries from NASA's Apollo program. [Thursday, July 2, 2009] Aerojet has completed manufacturing and assembly of an advanced 5,500-lbf LOX LCH4rocket engine. Aerojet will soon begin testing this advanced engine. 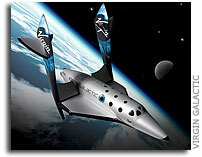 [Friday, July 10, 2009] At present, fewer than 500 people have ventured into space, but Virgin Galactic already has nearly 300 people from 42 countries waiting in the wings, including Virtuoso CEO, Matthew D. Upchurch. 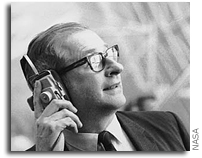 [Friday, July 10, 2009] The NASA History Division has a requirement for the commercial service of writing a complete scholarly book-length biography of Dr. Thomas Paine, NASA's third Administrator. [Friday, July 10, 2009] NASA's Innovative Partnerships Program, working with the Office of the Chief Engineer at NASA Headquarters, has selected 20 projects for the 2009 NASA Innovation Fund. [Wednesday, July 15, 2009] The National Polar-orbiting Operational Environmental Satellite System (NPOESS) team reached a major milestone as the final portion of the NPOESS Preparatory Project (NPP) ground system was transitioned to operations. [Wednesday, July 15, 2009] Space Exploration Technologies announces the successful launch of Falcon 1and delivery of Malaysia's RazakSAT into the correct orbit. [Thursday, July 16, 2009] - Google Lunar X PRIZE contender Odyssey Moon Limited announced today that top industry leaders Near Earth LLC, WPP Group, Aon and Milbank have joined its corporate team. [Thursday, July 16, 2009] A study performed by the Futron Corporation predicts that companies such as those competing for the Google Lunar X PRIZE will be able to address a market in excess of $1 billion over the course of the next decade. [Thursday, July 16, 2009] The Boeing Company today announced that Intelsat Ltd., the world's leading provider of fixed satellite services, has selected Boeing to build four telecommunication satellites that will refresh and add new capacity to Intelsat's global satellite fleet. [Sunday, July 19, 2009] Astrobotic Technology Inc. today released details of a lunar robot that can survive the blistering heat at the Moon's equator, which is the robot's destination in May 2011 when it will visit the Apollo 11 site. [Wednesday, July 22, 2009] NASA is issuing the third edition of the Workforce Transition Strategy, which details the agency's plan to minimize job losses while transitioning from the Space Shuttle Program to the Constellation Program. [Wednesday, July 22, 2009] NASA's desire to provide communications support for the ISS, Hubble, and other spacecraft moved closer to this goal in July when agency officials approved critical elements for the next generation of Tracking and Data Relay Satellites, TDRS K & TDRS L.
[Thursday, July 23, 2009] As the entire world celebrates the 40th anniversary of humankinds' first steps on the moon, gamers will soon have the chance to race other players on the moon's surface in their very own lunar racers. [Thursday, July 23, 2009] News media are invited to attend the Council on Competitiveness� Western Energy Summit focusing on energy innovation and deployment on Thursday, July 30, 2009 at NASA Ames Research Center, Moffett Field, Calif.
[Friday, July 24, 2009] XCOR Aerospace, Inc., announced today that it has finished a series of wind tunnel tests of the aerodynamic design of its Lynx suborbital launch vehicle. [Friday, July 24, 2009] This image shows our achievement of full-power full-field for the 1st stage of VASIMR. In addition, here are some recent video posts documenting this achievement with our new superconducting magnet. [Friday, July 24, 2009] Space Florida hosted a group of spaceport leaders from around the globe to attend the Commercial Spaceflight Federation's Spaceport Executive Summit, the first such event of its kind. [Friday, July 24, 2009] Flometrics, Inc. has successfully flown a liquid fueled rocket with a renewable version of JP-8. and liquid oxygen. The fuel was developed by the EERC under a DARPA contact. [Monday, July 27, 2009] MacDonald, Dettwiler and Associates Ltd. announced today that it has signed a contract for $4.6 million (CAD) to provide RADARSAT-2 satellite imagery to the European Space Agency (ESA). The imagery will be delivered from July 2009 until September 2010. [Tuesday, July 28, 2009] Abu Dhabi 's Aabar Investments and Virgin Group today announced that they have agreed to enter a strategic partnership, which will see Aabar take an equity stake in the world's first commercial spaceline - Virgin Galactic. [Tuesday, July 28, 2009] The Commercial Spaceflight Federation today announced the appointment of Makovsky + Company, one of the nation's largest independent public relations firms, as its public relations advisor. [Tuesday, July 28, 2009] Boeing announced today that the Tracking and Data Relay Satellite (TDRS) K program successfully completed its Ground Detailed Design Review (GDDR), held June 2-4 at NASA's White Sands Complex, N.M.
[Wednesday, July 29, 2009] Google Lunar X PRIZE contender Odyssey Moon Limited today is announcing its partnership with the International Space School Education Trust (ISSET) and their customer Moonlink Ltd. of Yorkshire to put a British science instrument on the Moon. 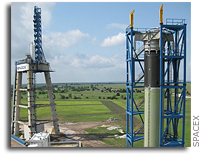 [Wednesday, July 29, 2009] Space Exploration Technologies (SpaceX) announces the successful completion of qualification testing for the Falcon 9 launch vehicle first stage tank and interstage. [Friday, July 31, 2009] For long-duration space missions, astronauts someday will grow plants for food and the air they breathe, while transforming inedible parts of the plants into useful resources, such as biofuels, food, and chemicals.